The Internet is constantly evolving and 2016 is set to be another action-packed year in the world of online marketing. Each year, new technology and new user preferences dictate sweeping changes that either get adopted or thrown out. Early adopters get a leg up on the competition, appealing to prospective patients in innovative ways. The key is to anticipate these changes, and adapt to compete effectively in your local patient jurisdiction. We decided to recap the online chiropractic marketing trends from 2015 and predict how you can make 2016 your best year to date. The three areas we’ll focus on are website design, SEO, and social media. For the first time, mobile searches outperformed desktop searches in 2015. Today, more people are using tablets and smartphones as their primary computing devices. This makes mobile-friendly website design more important than ever. It’s important that your website displays optimally across all devices. This is referred to as “responsive design.” A website with responsive design determines the screen resolution and operating system of a device. Based on this data, the website intelligently displays the text and graphic elements of the page – personalized for that particular device. Bonus: Check to see if your website is mobile-friendly with this free test. Sure, outlining your services is important. Prospective patients need to know what you do. But does that make them trust you? It’s important to have a personal “About Us” or “Meet the Chiropractor” page on your website. Patients want to know that you’re willing to build a relationship with them, so they can feel comfortable visiting your office. In addition to simply having the money pages, you need to showcase them so they’re easily found. This could mean adding them to your navigation menu, or even displaying them in a clickable homepage banner. To enhance and personalize the content on your pages, include custom photos of your office, team members, and most importantly – yourself! Putting a face with your name shows that you are a real person. With real photos, visitors can see what your practice is about before stepping into your office. Your homepage is the gateway to your practice website. It’s the place where prospective patients decide whether or not you’re worth their time. Remember, the back button is only a click away. You have a matter of seconds to capture their attention. So if you can’t engage them the moment they arrive on your site, they’re on to one of your competitors. When it comes to your homepage, less is more. A distracting design with too many options will result in visitor paralysis. You want a clean website that encourages visitors to learn about you and what you have to offer. The content on your homepage should be brief and precise. Prospective patients shouldn’t have to sift through lengthy blocks of text before understanding who you are and what you do. 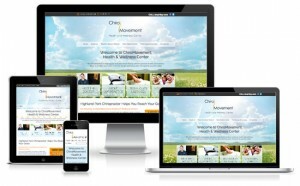 At Perfect Patients, we continually monitor our chiropractic website designs to optimize new patient performance. Using “heatmap” technology, we’re able to see where people click when they land on a site. This tool allows us to see how users are engaging. How do your existing patients perceive you? Answering this question is one of the most fundamental tasks your website should accomplish. By including testimonials on your site*, you not only answer this question, you transform your sales pitch into a credible, unbiased recommendation for your practice. Adding this single element to your website will grow your patient base, while encouraging patients to promote your services for you. Why are testimonials so effective? They establish trust. When your patients rave about your practice, they’re telling website visitors they can trust you. They sell, without being “salesy.” Because testimonials aren’t written in your “voice,” they stick out in your content as candid accounts of your reputation. They overcome skepticism. A powerful testimonial convinces even the “toughest sell” patients that you impacted your patient’s life in a positive way. In addition to written testimonials, consider video testimonials as an option to give a more in-depth look into the patient experience (just make sure the patient has signed a consent form). Even more important than reviews on your own site, it’s critical to have a favorable reputation on third party review sites. Reviews on platforms such as Yelp and Google My Business seem to carry more weight with prospective patients – they view them as an unbiased look inside your practice. Next time you receive a compliment from a patient, request that they leave an online review on a third party site. Stay active on social media to engage your existing patients and encourage feedback. Most importantly, always provide outstanding customer service! Above all, this will increase the likelihood that a patient will write a positive review. *Be sure to check on the regulations surrounding testimonials in your jurisdiction, as some areas place restrictions on the types of reviews used and how you solicit them. 2015 was a lively year for the SEO world. We experienced the long-awaited Mobilegeddon update (which penalized sites that weren’t mobile-compliant), an overhaul to local rankings, an algorithm update for content, and several other Google updates. This upcoming year should present more landmark shifts in search marketing. But one thing remains constant: effective SEO is a formula of many strategies that can impact each and every site differently. On-page Signals: Websites should properly implement on-page SEO best practices, including relevant titles, meta descriptions, and a focus keyword. External Signals: Your practice information (name, phone number, and address) should be accurate across all external websites. Google My Business: A new “snack pack” listing format was introduced. This change resulted in displaying just three map listings (rather than seven) on a Google search page. Link Signals: Gaining links from other websites is still important. But links from low quality sites will not help – potentially even hurt – your rankings. 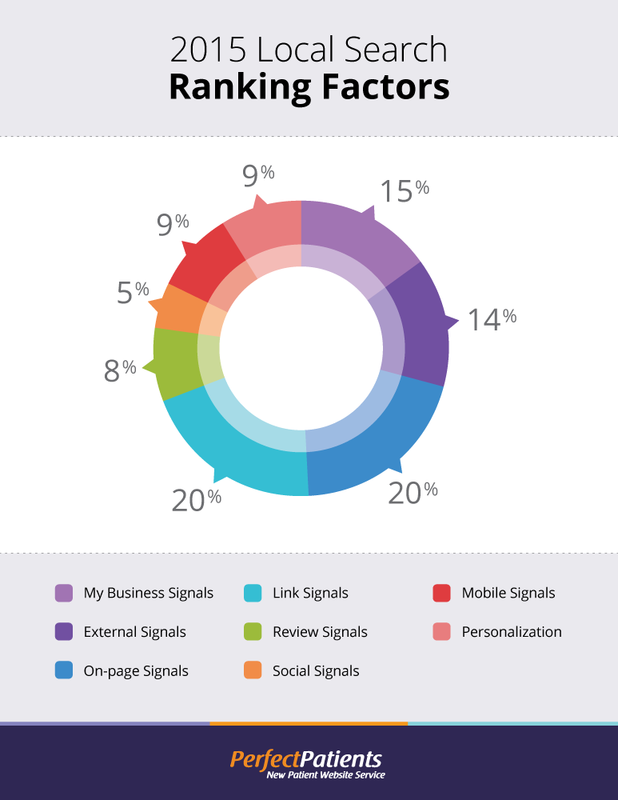 Social Signals: Active social media pages may improve rankings for individual pages. Setting up a Twitter and Facebook business page is a great place to start. Review Signals: A positive online reputation seems to improve rankings for your practice website by establishing credibility in Google’s eyes. Personalization: Google’s algorithms have become more sophisticated. Depending on past activity, search results can be customized for that individual. Mobile Signals: Last year, Google implemented a massive update, penned in the SEO world as “Mobilegeddon.” This update gave favor to websites that are friendly to mobile users. For the past several years, Google has been targeting deceptive SEO practices. There was a time when we could move a few levers and turn a few dials and voila! – better ranking. Not so much these days. Gaming the system is virtually impossible and far too risky anyway (referred to as “black hat SEO”). Instead, we make a few changes, wait, make a few more changes and wait some more. Google finds sudden moves or significant changes to be suspicious. It has to look natural. Create original content that provides value to readers. Earn links to your website, with quality content, rather than buying links. Include targeted keywords in your content, appropriately, while making the content flow naturally. Promote blogs and other content assets on social media. Social media marketing has always been a peculiar animal. Early on, critics insisted that it wasn’t a viable chiropractic marketing strategy. We’re now in an era with reliable platforms, paid advertising options, and free opportunities to publish content. But while social media is well-established, implementation strategies continue to evolve. Social media grew in importance throughout 2015. There seem to be SEO benefits for having a strong social presence. Content shared across social platforms tends to rank better in Google. We anticipate that the potency of social signals will continue to grow in 2016. 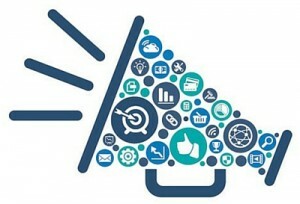 There are still many misconceptions about social media marketing. This became especially evident last year. A big misconception about social media for chiropractors is what to expect in terms of new patient growth. If nothing else, understand this point: Having a Facebook business page is not a replacement for having a practice website. Why? Because social media is not the primary source for reaching new patients. Patients aren’t turning to social media to find new healthcare providers unless they’re asking for a recommendation from friends, and those friends are sure to visit the website before making a call. That’s what Google is for (hence, the importance of having your own website). 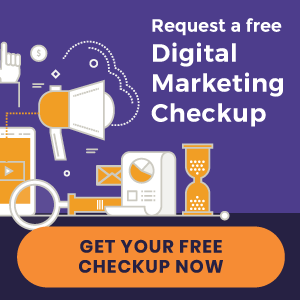 Your website, combined with other online marketing campaigns, is what attracts prospective patients who have never heard of you. Social media is a way to build community among existing patients. Social platforms like Facebook and Twitter are great ways to communicate with patients. These interactions can lead to repeat appointments and patient referrals. Retention: By keeping active on social media, you stay at the top of your patients’ minds. This, in turn, promotes repeat appointments. Referrals: The purpose of social media is precisely what the term implies: It’s to be social. By engaging patients on social media, you’re encouraging existing patients to refer you to their peers. Link to your social profiles on your practice website. It’s best to use social media icons that are placed in the header, footer, or sidebar. Use hashtags where appropriate to expand your reach (i.e. #MotivationMonday and #WellnessWednesday). Make a goal of posting to Facebook and Twitter once a day. If you’re short on time, ask one of your staff members for help. Social media is image-driven, so attach images to your status updates. You can use free image tools like Canva.com to create your own graphics. Treat social media platforms the way they were intended. Publish short and precise status updates that will engage patients. Longer content should be reserved for your practice blog. These are the key chiropractic marketing trends we believe will be important in 2016. As things can move quickly, we like to stay on top of the latest trends throughout the year. To keep current yourself, subscribe to our blog for the latest tips on growing your online presence. In addition, download our free eBook below and make 2016 your best year yet.